The Border Collie is a breed of dog that originated along the English-Scottish border. It is one of the most intelligent dog breeds. They have been used to herd livestock for over 300 years. It is also famous for a pet or show-dog. The border collie is about 20 inches (51 cm) in height and weighs 31 to 50 pounds (14 to 23 kg). It is usually a long-haired dog. Its coat is often black and white in color. ↑ "Border collie". Encyclopædia Britannica Online. Retrieved 2010-08-21. 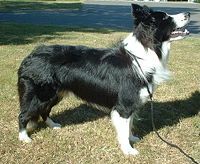 Wikimedia Commons has media related to Border Collie. This page was last changed on 14 May 2015, at 15:06.